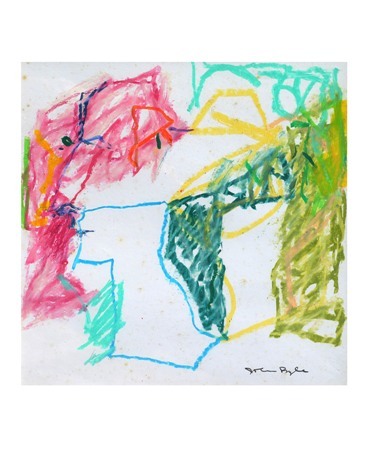 John Byle, the American born artist who immigrated to Israel in 1951, is numbered among this country’s leading abstract painters. Nevertheless, he may well be remembered best as an educator; and one might ask why? Founder of the Fine Arts department at the Bezalel Academy and its director for more than a decade (1967-77), his pluralistic approach, as well as his insistence on introducing academic studies to the faculty alongside professional arts courses, not only propelled forward the careers of many young artists but set standards for the training of artists country wide. But this undertaking, with its highs and lows, successes and disappointments, devoured Byle’s time and energy; obliging him largely to set his own vocation and ambitions as a painter to one side. Dialogue between Contrasts, a newly opened show of his small format works dating from the 1950s to almost the present day, comes as a timely reminder of this artist’s true worth. It also illustrates just how joyful and captivating pure painting can be, without the contemporary need to interweave with another medium such as sculpture or photography, or incorporate a narrative or message. For many Israelis abstract painting at mid 20th century meant just one thing: the parochial New Horizons School of painting, instigated and dominated by the artist Josef Zaritsky. Although modeled on examples of lyrical abstract paintings emanating from Paris, this local version possessed its own character, distinguished by a certain ethereality and a low key, almost monochrome palette. But, as the earliest of Byle’s works illustrate – paintings from the late 1950s built up from over-lapping blocks of color, some having the resonance of stained glass – this was not his direction. Trained at the Art Institute of Chicago, he reached out instead to international styles of abstract painting. 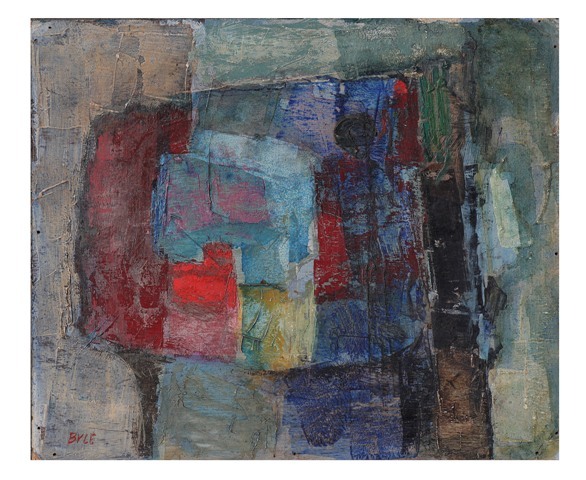 By the early 1960s, Byle had ceased painting with oils, and started to work only with acrylics or pastel crayons. 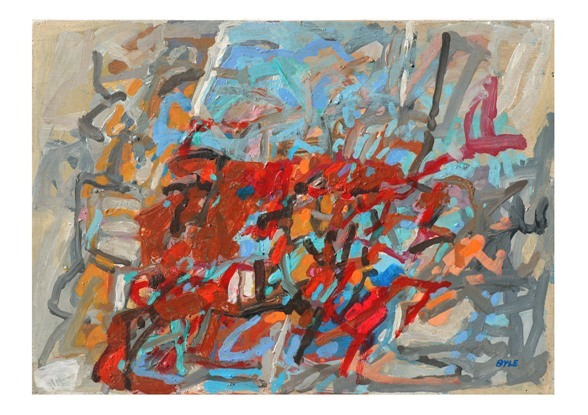 The results of this switch are illustrated in a standout acrylic painting from 1978 (representative of many), in which a a jazzy tangle of red, black and grey lines overlapping muted color patches project a sense of forceful movement. In 1985, Byle took up an eight-month residency in Paris at the Cité Internationale des Arts where pining for the Israeli sun, he produced canvasses in the brightest of hues, with the emphasis on reds and magenta. Judging from works he produced in the years directly after his return ( see an example above from 1988), this experience was of great importance. 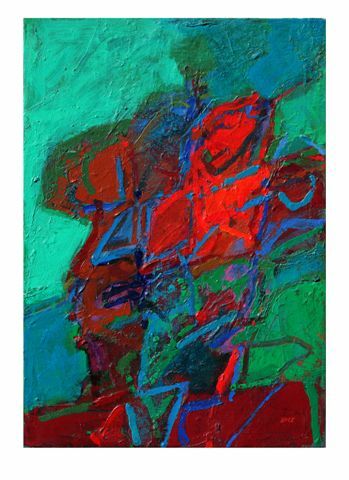 His paintings, still brilliant with color, became less frenetic and more ordered, colors, shapes and line forming especially harmonious configurations. Although Byle relates that his first abstract painting was actually drawn from Nature – the abstracted form of a pigeon that ‘appeared’ on his canvas whilst painting a view of the old city of Jerusalem – his mature abstractions (unlike those of the New Horizons group) are not derived from local landscape. Yet, if one looks closely, in particular at a set of pastels on paper he created in 2002 , hints of figures and objects are to be found. Perhaps these fragments represent Byle’s memories of his travels in Mexico, Guatemala and the Far East. These drawings, unlike his closely packed acrylic compositions of the previous decades, are remarkable for their delicacy and restraint, with the white space of the paper becoming an equal partner in Byle’s ongoing romance with abstraction. A warmly recommended exhibition. This show, open till October 24 is curated by Irit Levin. It is located at the Joseph Wiessman Municipal Gallery, Machon Hamayim, 7 Hashomer St. Givatyim. Opening hours: Tues., Wed., and Friday from 11:00 – 14:00.